Includes BRS PRO DI Resins! 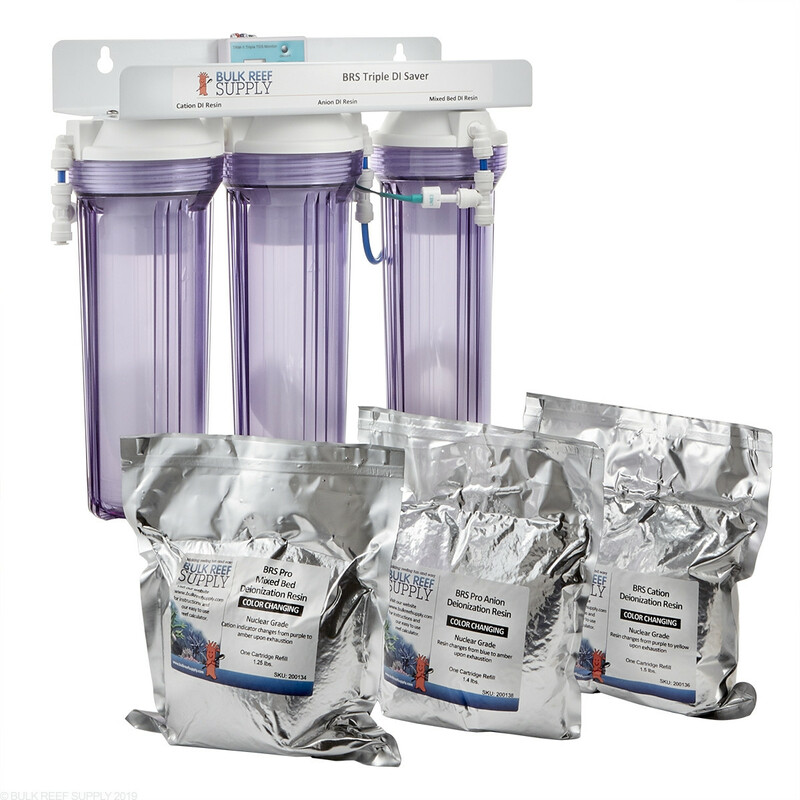 Triple Deionization Saver canister kit complete with HM Digital Triple Inline TDS Meter & BRS Pro Series Single Bed Cation Resin, Pro Series Single Bed Anion Resin, and Pro Series Mixed Bed Cation Color Changing Resins. 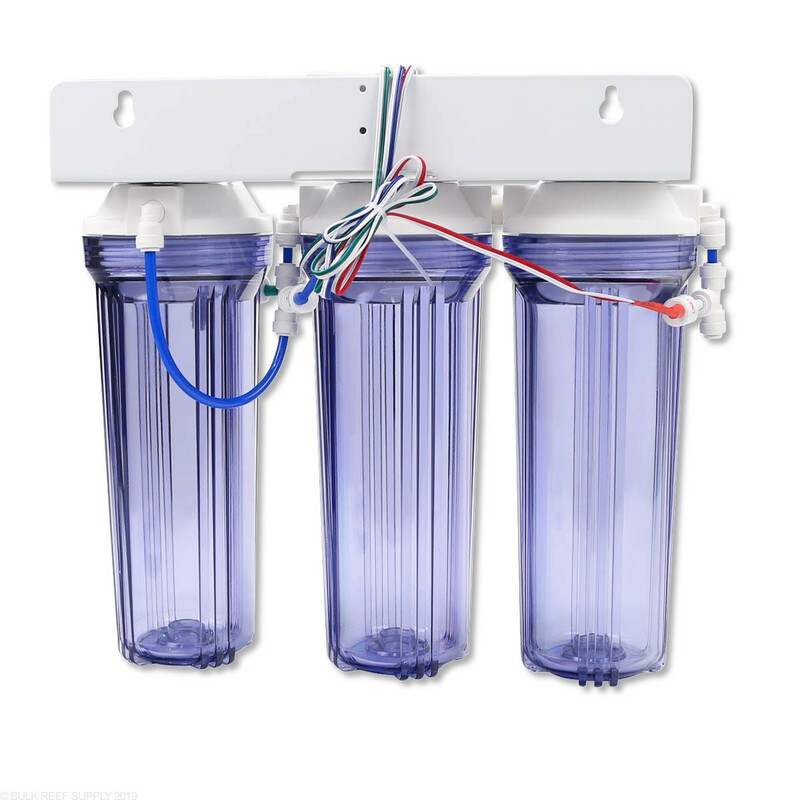 This is the perfect add-on to any reverse osmosis system or replacement for your current deionization stages. 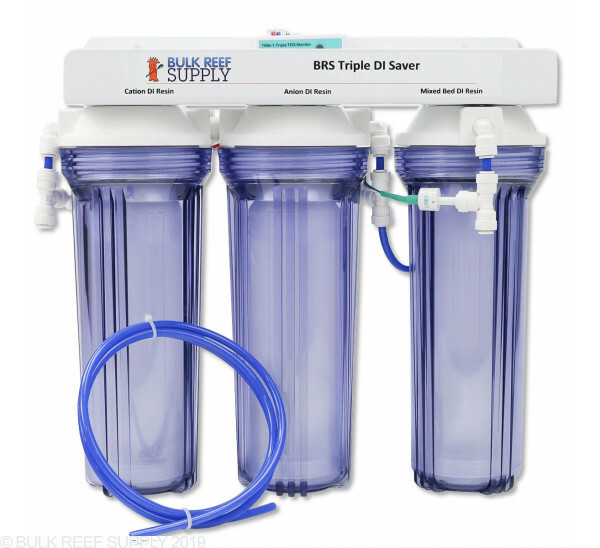 The triple DI system has been designed to be super efficient with DI resin, allowing you to only replace what has been used. Using single bed resins will give you the ability to use 100% of the resin without having to throw any good resin away. Traditional mixed bed systems are technically exhausted when one of the two charges neutralizes and cannot remove the ions to achieve 0 TDS, even though a portion of the resin may still be usable. Even though using a cation and anion single bed resin will remove a vast majority of TDS it is necessary to use a mixed bed resin after the single bed resins for the best results. Now when it comes to changing your Deionization resins you only need to replace what has been used! 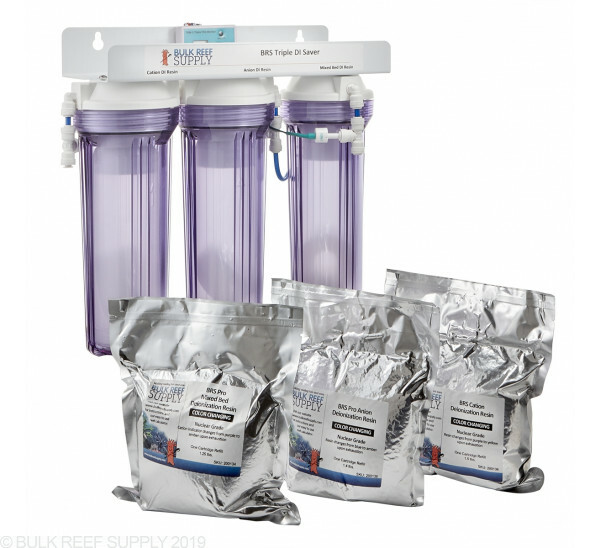 Many reefers will find that they either use a majority of the single bed anion or cation resin, but hardly any of the other single bed and mixed bed resins keeping the system very efficient. A little extra money upfront will pay off in the long run with the savings in resin! If the system is maintained correctly the mixed bed resin may never have to be changed. 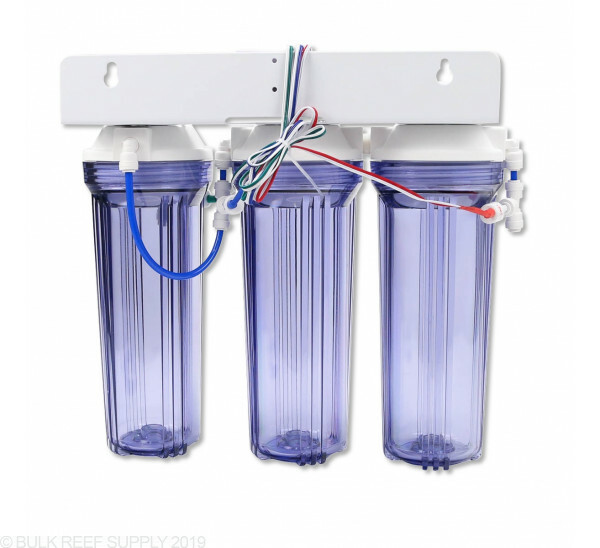 All of our RO and DI systems use 1/4" push connect tubing and high-quality Mur-Lok fittings allowing them to be compatible with any BRS RO/DI system and most others on the market today. 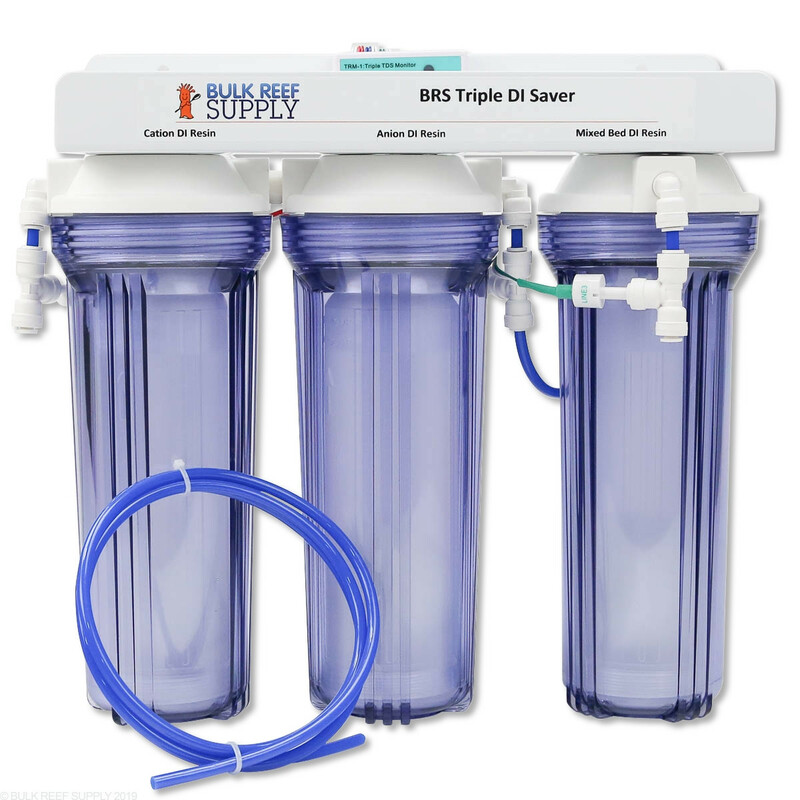 We only use nuclear grade deionization resin allowing you to create higher quality water with less resin. Dimensions - 15.25" x 6.25" x 14"
I'm on well water and was blowing through mixed DI resin about 1 cartridge every 3-4 weeks (Doing 10 gal H20 every week and ATO on 75G tank). Since upgrading to the pro system I'm still on the first Anion cartridge after 7 weeks (it's about 50% gone). Neither of the other 2 cartridges show any wear. I ended up putting my former 2 stage mixed beds behind the pro setup for the heck of it, but resin use overall is way lower than before. I did the math and this is an amazing deal for adding additional DI to your system. Don't bother with the two stage! Don't forget to change the hose/tubing routing when you add this, and don't forget an additional Carbon Filter. What are the color changes for each resin? Also, with the new tinted chambers, it's hard to tell what color is there. Any tips to seeing the color changes, besides an obvious flashlight? Hey there! It will be a very distinct color change from blue or purple to a amber/brown color. You will notice it starting at the bottom and go up. A flashlight is actually the best tool to see inside of those canisters!